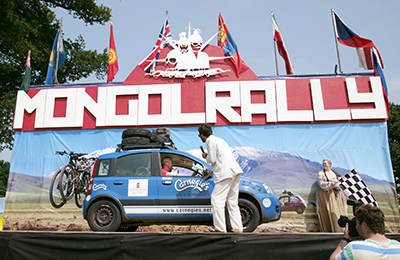 This is an extract from my account of the The Khan Teams Mongol Rally. 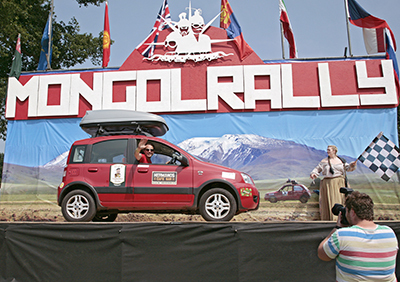 It is the tale of 3 cars and 6 people’s attempt to drive from England to Mongolia. Our route was to take us 10,000 miles and through 18 countries We did so for the experience, adventure and to raise money for the Cool Earth charity. The story so far: After months of organisation we have made it to the start line. This years start is from Bodiam Castle as is the leaving party the night before. My eyes seem to be having some issues with opening, and I am fairly sure it is customary for my mouth to contain some moisture. There is a litre bottle of water unopened propped on top of a pile of my discarded clothes. I am pretty positive I bought that with the specific intention of drinking it before going to bed. I think my reasoning was to stave off a hangover. I raise my head. This action immediately alerts me to the fact that my brain has swollen overnight and is now pushing against the backs of my eyes. I collapse back down on my pillow but I know I must move very soon, as my tent holds aspirations to be a sauna. A fellow camper’s voice with a heavy Australian accent breaches the thin layers of my tent, “I can only see one or two chunks in the tent”. I close my eyes. How did I get into this state? Dim recollections are invading my semi consciousness. There was a castle, mead, a lot of cars, sunshine, wenches, knights, stickers and men in Speedos! 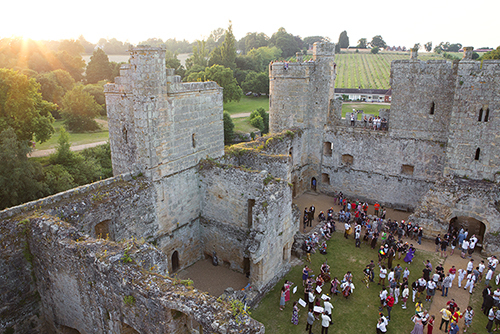 The Mongol Rally launch party 2013 at Bodiam Castle was beautiful and great fun. What a location and what weather. Finally the Khan We Make It teams and cars were all together in one place. In front of our cars is a small wooden ramp no more than a couple of meters high. At the top is a man with a microphone and a woman dressed as a medieval wench waving a chequered flag. Well, why wouldn’t there be? It is a small ramp. It will take no more then four or five seconds for us to mount and drive down the other side. The trouble is what lies beyond it isn’t very small. It is a very very long road, with a whole bunch of unknown and hopefully a very very cold beer in Ulaanbaatar. We are winding our way down a snaking mountain road. Forest trees lean in from either side of the road. The occasional breaks in their canopy reveal silently glimmering stars whose light momentarily turns the tarmac to silver. Joss and Ant lead the way in I Think We Khan (the blue car), followed by Julie and Dave in I Am Sure We Khan (the silver car) and lastly Thomas and me in I Know I Khan (the red car). We round yet another S bend and the trees drop away to our right, exposing a fantastical fairy-tale castle perched neatly on a hilltop, the village of Vianden nestling quietly below. The road turns into cobbles and our sat navs inform us our destination is close. After 265 miles and eight hours we can finally say we survived day 1. There is no discernable form of life between Belgium and Luxembourg. We can’t operate Belgium petrol pumps. Ant doesn’t have a PIN number for his credit card. Luxembourg is very beautiful, the very little we saw of it. Ferry food has improved significantly since 1988. I can confirm the bronze Daewoo bought by 2 Americans on eBay in the U.K. that barely made it off the launch ramp – losing its tailpipe in the process – made it to France. Staying in convoy isn’t easy. This entry was posted on April 27, 2014 by laurienoble. It was filed under Uncategorized and was tagged with 5D III, Bodiam Castle, Canon 1DS III, Canon 24-70mm, Canon 70 - 200mm, Fiat Panda, Lowepro CompuTrekker, Mongol Rally, Photography.